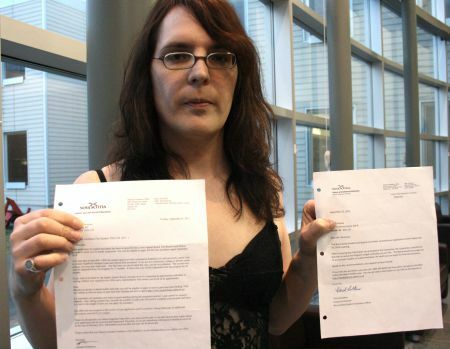 (K'JIPUKTUK) HALIFAX -- Jessica Dempsey, a transgender student at Dalhousie, has filed a human rights complaint against the Department of Labour and Advanced Education, alleging discrimination because of her learning disability and her gender identity. This is her second human rights complaint this year. Dempsey began her second degree at Dalhousie in September 2011. She received loans from the department for this degree and her previous one as well. Dempsey says she was initially denied more funding because of exceeding program length restrictions. During her appeal presentation in September 2013, Dempsey brought medical documents to explain her disability -- which would let let her override the program length restrictions. Dempsey ultimately lost satisfactory academic standing with the loans committee when she failed two math classes -- which she attributes to the learning disability she developed while transitioning. Despite asking to be identified with female gender pronouns, Dempsey says she was misgendered twice in documents and once in person while communicating with the appeal boards. But the department continued to use male pronouns and refer to Dempsey by her old name. After speaking with the department in person, Dempsey says she finally received an email saying they had a legal obligation to update their records. The department apologized for the mistake, but when Dempsey appeared for a meeting in March 2014, the student loans officer kept referring to her with male pronouns, she says. Dempsey says she’s disappointed by what she perceives as a lack of respect for her gender identity. “It would have been nice to actually include a transgender person, to bring people in who know what they’re talking about. … If they did this it would help them understand the implications it has for people,” she says. In Oct. 2013, Dempsey filed her first Human Rights complaint against ARAMARK food services at Dalhousie, because of harassment she claims she received from staff. Dempsey will discuss the harassment claim with ARAMARK at the Human Rights Commission, but an official date has not yet been set.